A few months ago, NVIDIA released the GeForce GTX 1070 Ti series with their Founders Edition card, accompanied by a number of partner boards. Targeting the competing Radeon RX Vega 56, the launch put the GTX 1070 Ti right between the GeForce GTX 1080 and 1070 in terms of price and performance, filling a gap that was not particularly wide in the first place. That level of performance was achieved through a new 19 SM configuration of GP104 with a 180W TDP and 1607MHz core clock over the GeForce GTX 1070 with its 15 SMs, 150W TDP, and 1506MHz core clock. And in consideration of that, all partner GTX 1070 Ti cards adhere to the reference 1607MHz core and 1683MHz boost clocks. In this way, the model could exist in the $450 – $500 MSRP window without significantly cannibalizing sales of the neighboring GTX 1080 and 1070. So for EVGA, they rolled out four GeForce GTX 1070 Ti models at launch, all featuring the same clocks. But as NVIDIA did with the Founders Edition, EVGA is also pushing overclocking as one of the selling points, leaning on their Precision XOC utility and its GTX 1070 Ti specific overclock autoscan. 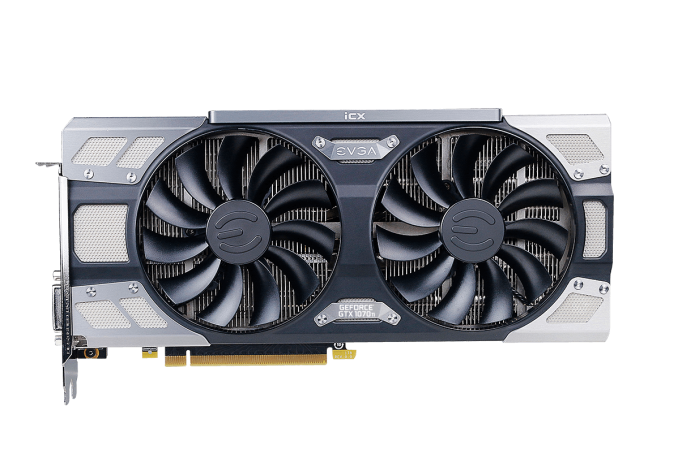 Going straight to the higher-end with the FTW model, today we are taking a look at the EVGA GeForce GTX 1070 Ti FTW2, equipped with the iCX temperature sensor and cooling system. GTX 1070 Ti SC Black Ed. Because of the enforced reference clocks, we have the interesting scenario where EVGA’s factory overclock tiers of SC to FTW do not actually denote factory overclocks, though presumably the GTX 1070 Ti FTW2 remains capable of higher manual overclocks than the others. Without such factory overclocks, the distinguishing elements of the GeForce GTX 1070 Ti FTW2 come down to the iCX cooler, power system, dual BIOS, and, naturally, RGB LED capability, a featureset identical to EVGA’s GTX 1070 and 1080 FTW2 iCX models. In any case, manual overclocking is still permitted, which EVGA has tried to make as straightforward as possible with their confusingly named Precision XOC feature “XOC Scanner” that is exclusive to the GTX 1070 Ti for the time being. In short, XOC Scanner will scan, test, and apply in a single step as opposed to the multiple steps needed in utilizing OC ScannerX normally. Without manual overclocking, the GTX 1070 Ti FTW2 is nominally specified at reference clocks even though the FTW2 features a higher power limit, improved cooling, and better power subsystem than the Founders Edition, so performance will be very similar out-of-the-box. With the exception of the EVGA’s hybrid cooled GTX 1070 Ti, the launch cards and later FTW2 Ultra Silent are still priced conforming to the GTX 1070 Ti’s price window, and reflecting the quality and feature differences. Except quite noticeably, the EVGA store pricing at the time of writing is very much inflated from launch, coupled with almost every product being out-of-stock. For those who haven’t come across the extraordinary amount of cryptocurrency news coverage of the past few months, demand for graphics cards in mining cryptocurrency continues to exceed sensibility and has somehow reached a new high. The end result is that current GTX 1070 Ti FTW2 pricing is not applicable at all to more normal circumstances, something that is especially significant to the GTX 1070 Ti lineups given their price window between the GTX 1080 and 1070. In more concrete terms, the going rate for GTX 1070 Ti models at the time of writing is in the $500 to $1000 range – assuming they can be found in stock. 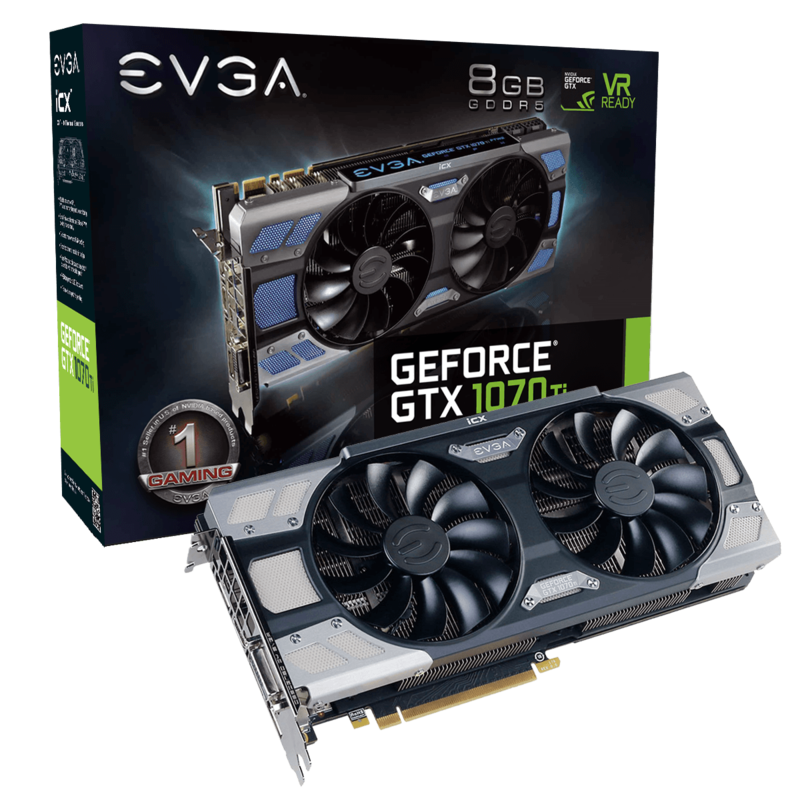 The specific card of today’s review, the EVGA GeForce GTX 1070 Ti FTW2, is currently listed at $1300 on Amazon, $100 more expensive than purchasing a Titan Xp directly from NVIDIA. The pricing inflation is such that prebuilt gaming PCs may provide more value than a marked-up graphics card. Though it is safe to say that in this market, there is little concern of sales cannibalization by the GeForce GTX 1070 Ti. As for its nominal competitor, the Radeon RX Vega 56 is listed around $1000 or more, and seems to be much shorter supply. The other current event, no less significant in impact, is the outing of the Spectre and Meltdown CPU exploits and the corresponding performance-affecting security patches, which we will touch upon in a later section.